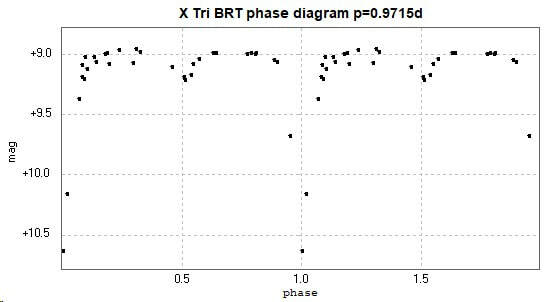 Light curves and phase diagram of the EA type eclipsing binary X Tri. 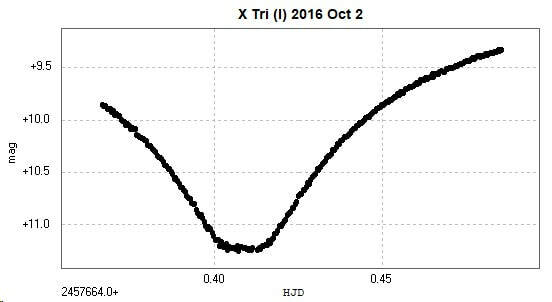 Primary minimum light curve constructed from 253 unfiltered images taken with a 2" object lens and Atik Titan monochrome CCD camera (the 2" Titan)from Somerby Observatory, Melton Mowbray, UK on 2016 October 2. The results have not been transformed. 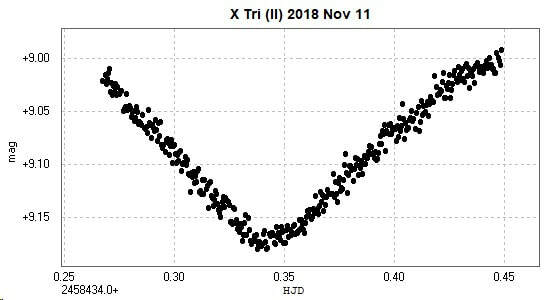 Secondary minimum light curve observed from Somerby Observatory on 2018 November 11, also with the 2" Titan, constructed from photometry of 379 unfiltered images. 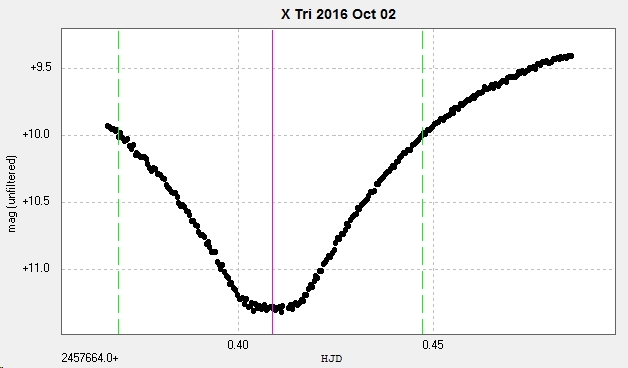 The following light curve and phase diagram were constructed from photometry of 32 images taken with the Bradford Robotic Telescope Cluster Camera (BRT) between 13 October 2014 and 1 October 2016 through their tricolour green filter. 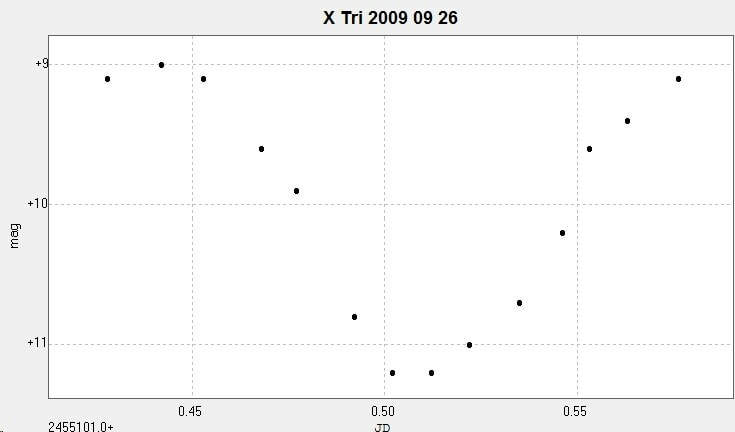 Combining the above three sets of data resulted in the following light curve and phase diagram. The BRT results are in black, the Somerby results are in red (primary minimum) and blue (secondary minimum). 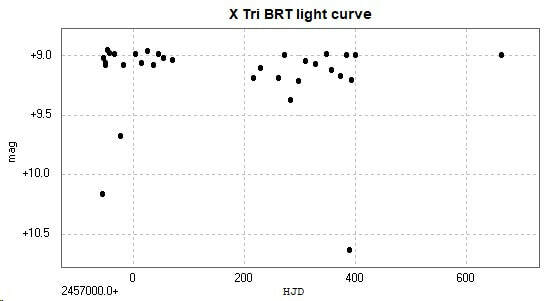 Although the BRT images were with a green filter and the Somerby images were unfiltered, the two curves overlap quite well due to careful selection of comparison stars - the same sets of comparisons were used for both sets of data. Using V filters for both sets of observations might have resulted in the maximum magnitude more closely matching the catalogued value of 8.55 (GCVS and AAVSO VSX), although there is some suggestion that the maximum magnitude should be 8.88 (see AAVSO VSX). Note that the following phase diagram uses the 'best fit' period to the above data, there is considerable o-c activity with this star (Kreiner). This is a minimum observed visually from Somerby with my 14 inch / 356mm Dobsonian reflector on 26 September 2009. This visual result is compared to the Somerby ccd observations below. 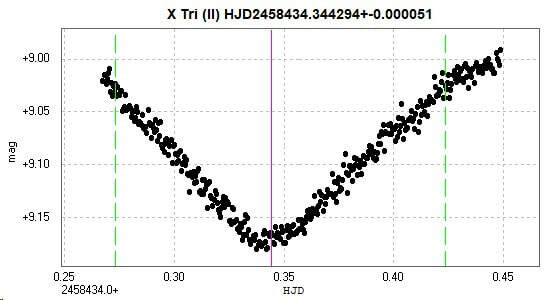 The visual curve was reduced in brightness by 0.1 mag to more closely fit the ccd results, but the shape of the two curves is encouraging, suggesting that visual observations still have a valuable place in variable star work.